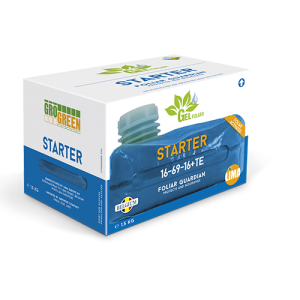 Grogreen Gel Starter for foliar application is a high phosphorus formulation for stages where sufficient phosphate uptake is crucial such as root development, flowering, fruit setting and transplanting. All nutrients are fully soluble and therefore more effective since it is completely assimilable and ready to use by crops. This complete NPK product provides several micronutrients such as Boron, Copper, Iron, Manganese, Zinc and Molybdenum. It is a widely used fertilizer in foliar application for its high purity and high solubility. It applies to all types of crops, arable crops and woody crops. When this fertilizer is dissolved in water, the pH drops slightly, preventing the formation of precipitates and facilitates its use in irrigation systems. It should be applied as fractionated as possible, dividing the total dosage depending on crop requirements throughout the crop cycle.